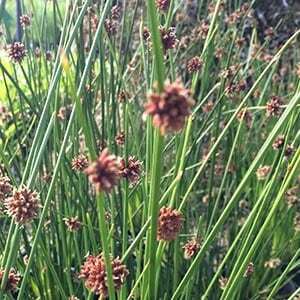 With a natural upright growth habit, Ficinia nodosa or ‘Knobby Club Rush’ makes a good feature or ornamental grass. Used widely in roadside platings in coastal areas as well a landscaping, it is also suited for mass planting. Maintenance is minimal with the plant being pruned back to ground level in early spring every 3 – 4 years to freshen up the foliage. You can also prune back any frost damage as needed. 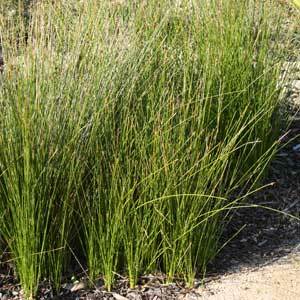 This is a tough plant once established able to cope with poor coastal soils and salty sea winds. Plant and water in, provide a little water through the first summer and then this is a very resilient plant. Easy by division of established clumps, also possible from seed. Soil – Tolerates a wide rang of soils from sandy loam to clay type soils. Height – To around 1 metre in height Spread – will form a clump to around 40 – 70 kms over time. Flowers – Small pale yellow flowers in spring to summer. Foliage – Mid to deep green with an upright habit. Frost tolerant -Mild frosts only.